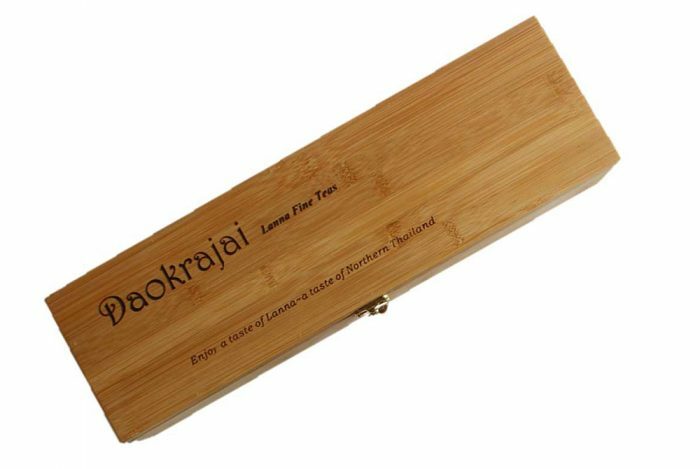 An engraved bamboo caddy with stand containing a selection of our most popular teas. 30% of the product price goes directly to Addenbrooke’s Charitable Trust. Help us to beat Breast Cancer! Addenbrooke’s Charitable Trust provides emergency treatment for many acute conditions including breast cancer. 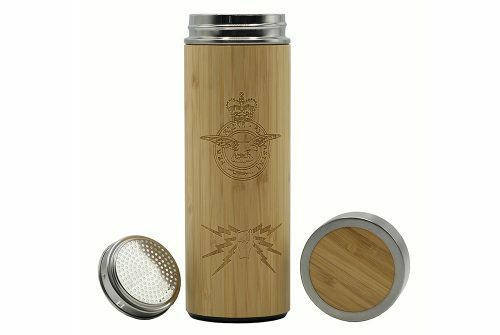 This bamboo Tea Caddy comes with a display stand and contains a selection of 5 of our most popular teas. 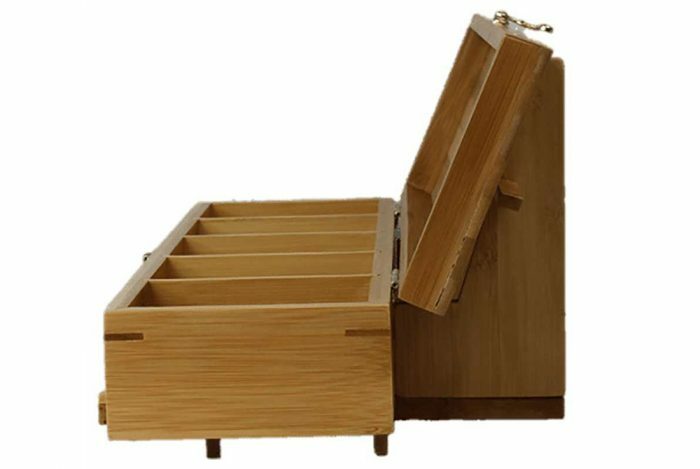 Bamboo is a totally sustainable resource, and is far more environmentally friendly than using wood. Hardwood trees take more than 60 years to mature before their wood can be used for furniture and such things. Some take 80 – 100 years or more. Bamboo matures between 3 and 5 years and grows prolifically across South East Asia. The Caddy contains 5 each of the following premium teas in 2g pyramid tea bags, each individually foil wrapped. 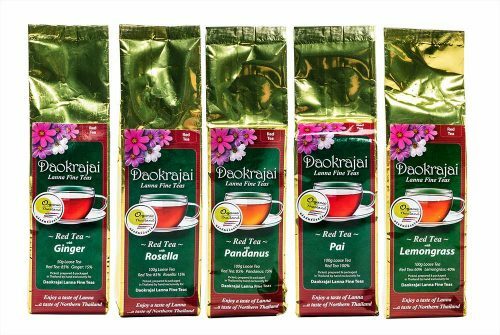 Red Tea with Lemongrass. A wonderfully refreshing tea, either hot or cold. Warming in winter and when iced, cooling without the calories in summer. Green Tea with Jasmine. 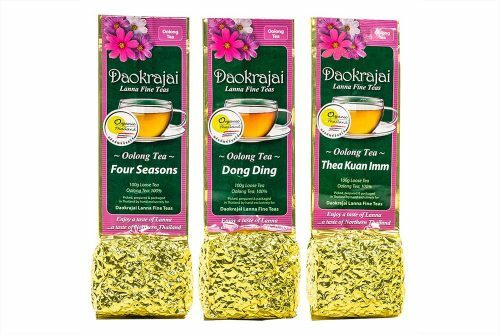 The most well known of the flavoured teas. While others may use artificial flavouring, we use natural Jasmine flowers to achieve the taste. A delightful taste and aroma. Green Tea with Moringa. Moringa is one of the most astonishingly nutritious herbs to be found. 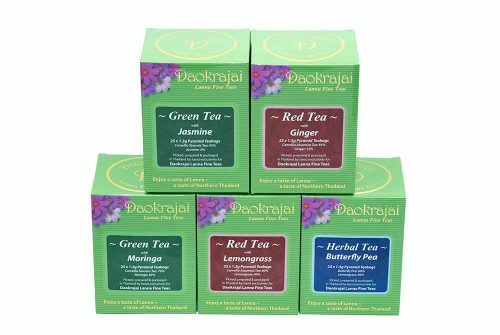 When married to our excellent Green Tea it produces a very smooth tea which is very relaxing. Oolong Tea ~ Tanjai. In Thai the word ‘Tanjai’ means ‘Whenever your Heart desires’. This tea is certainly that. Oolong is the Queen of Teas, and we marry our Milky Oolong (Jing Shuan) with the flowers of the Osmanthus to bring you a wonderfully clean taste with the superb aroma of the Osmanthus. Butterfly Pea with Lemongrass. 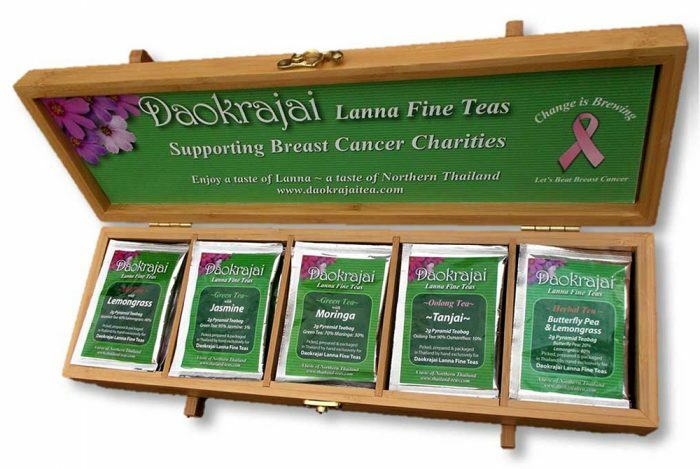 We believe that this tea is unique to Daokrajai. The tea is a deep blue when infused, and has a very smooth and creamy texture. Containing no Caffeine, it is an ideal night-time drink. (Add a drop of lemon juice, and see the colour dramatically change from Blue to Purple).